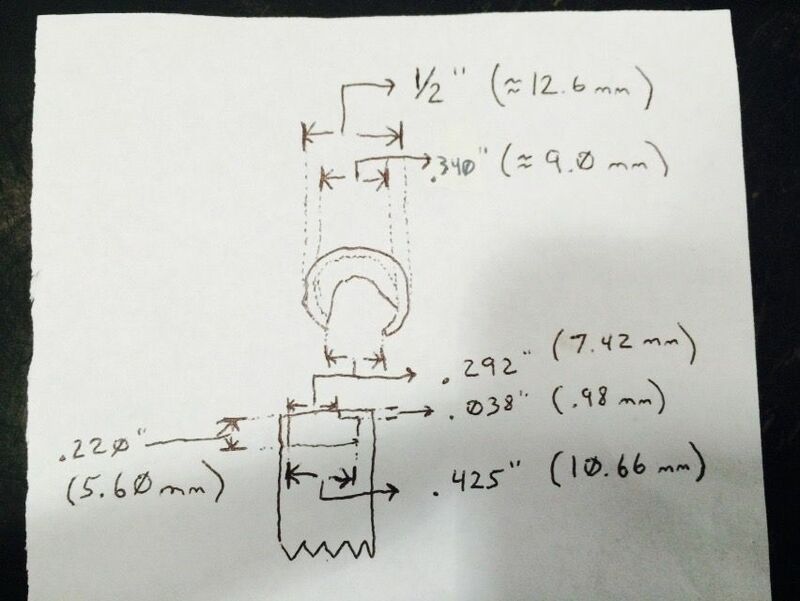 Have already done posts on how to get out the locking cam assembly using stuff you can find anywhere. 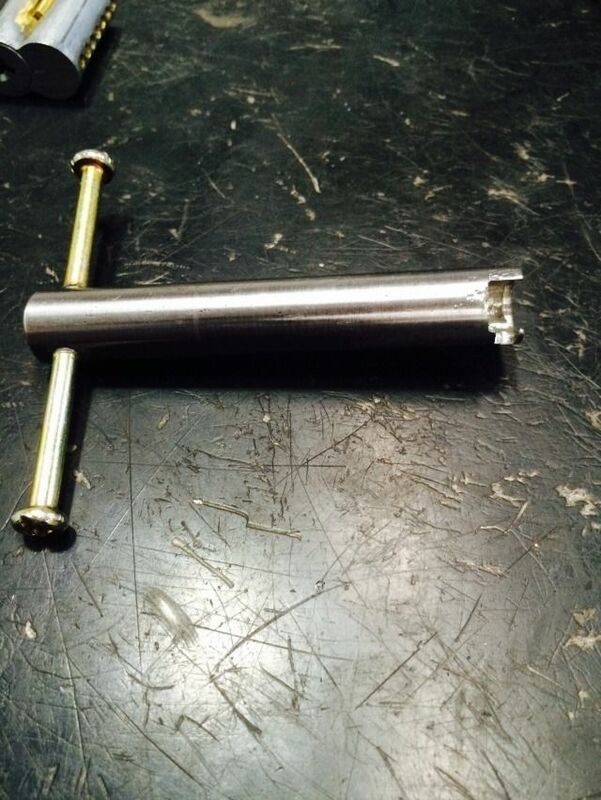 This post is on making a 'proper' disassembly tool, similar to the one sold by Best. 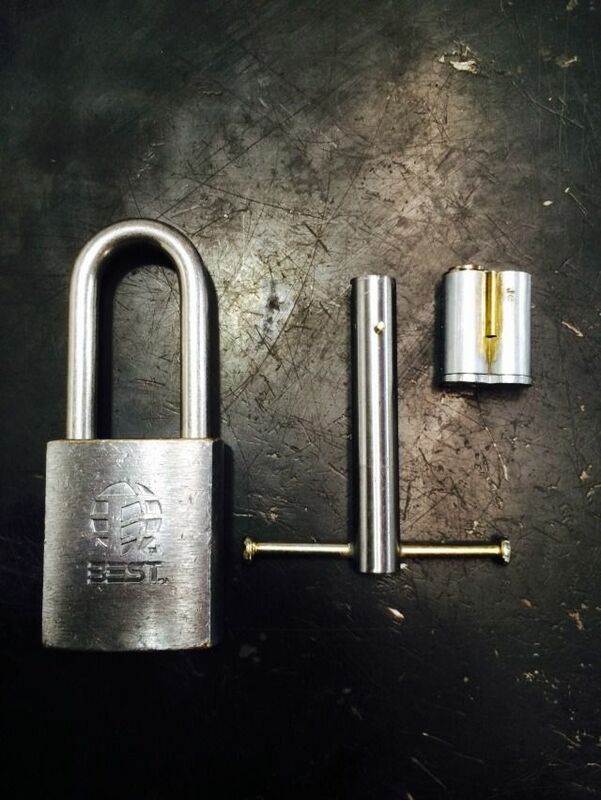 Here is the completed tool, between a padlock and core. 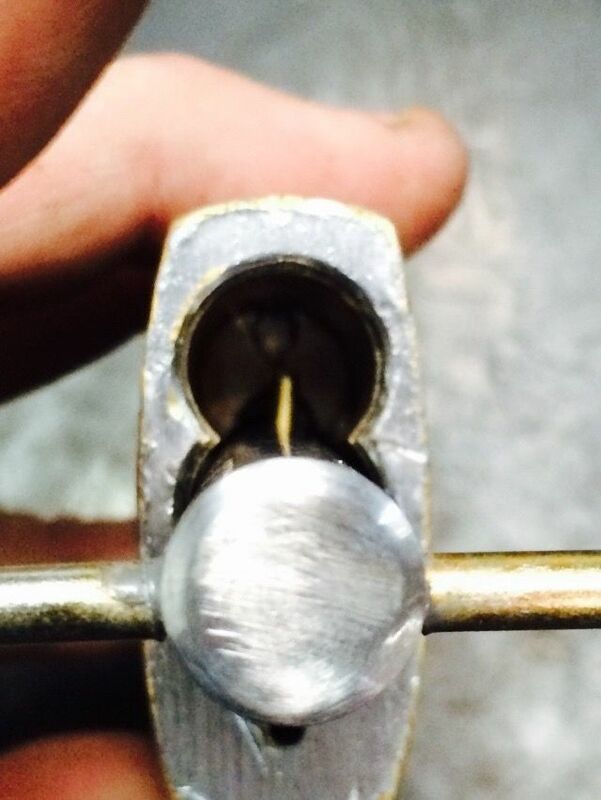 The tool works by compressing the spring on the locking cam assembly and rotating partly under the cam, then rotating the plate on the cam so it lines up with the groove in the lock body. 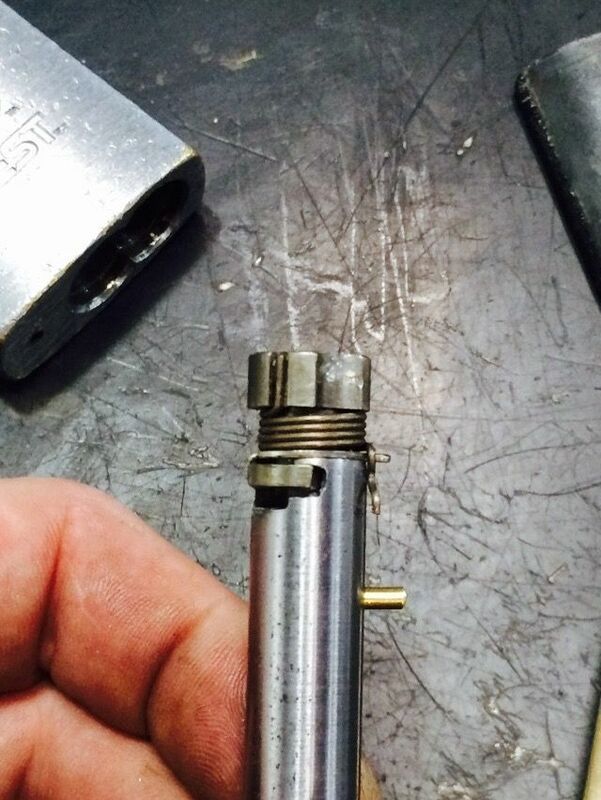 Then the locking cam assembly can be removed. It takes about a second or two. 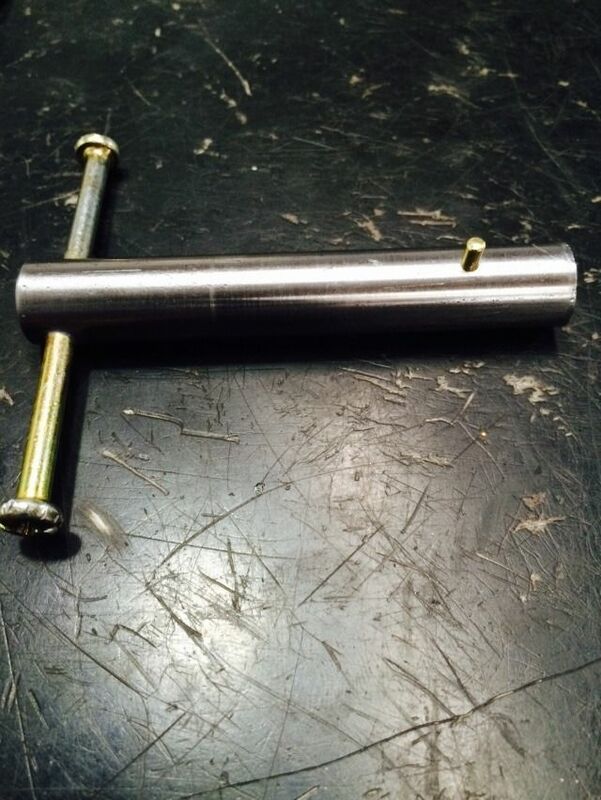 Made from 1/2" diameter steel rod, two screws with a long, threadless neck below the head of the screw, and a 3/32" brass rod for the alignment peg, this costs considerably less to make than the roughly $100 Best Access Systems charges for the tool. 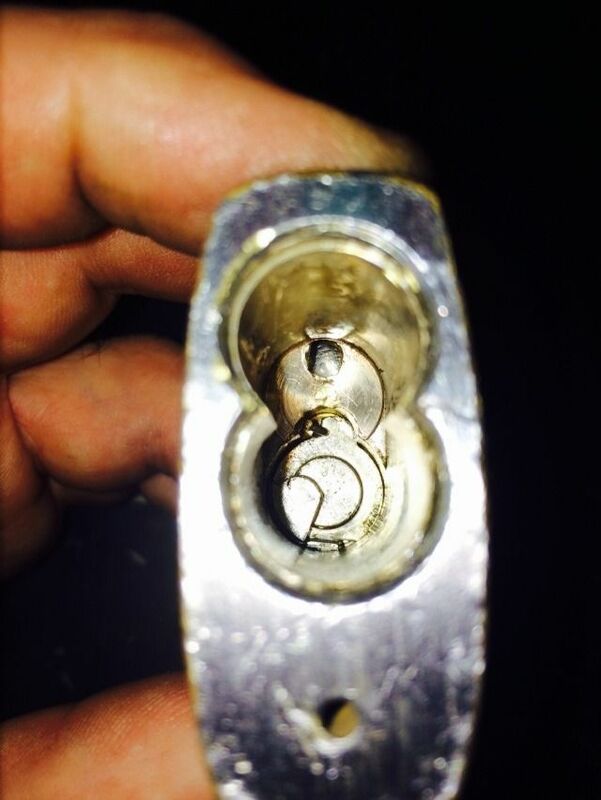 Here is the padlock with the core removed. 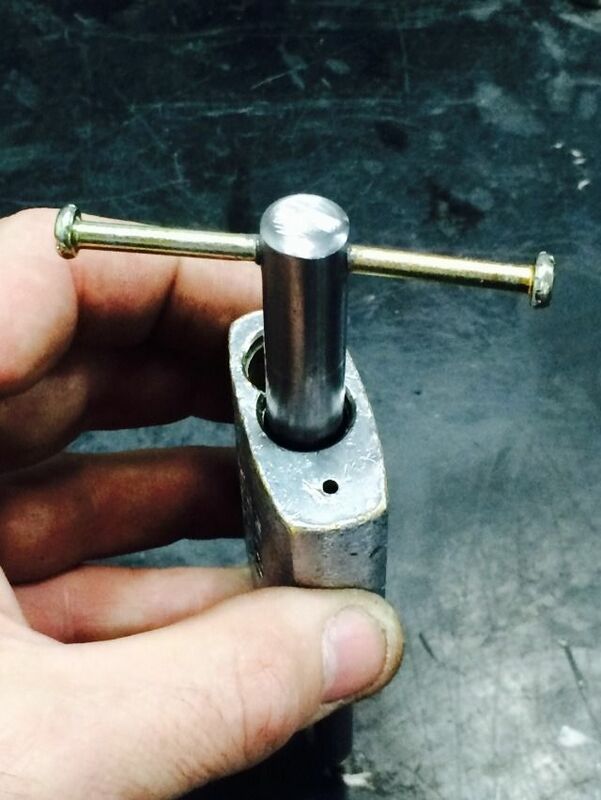 Put the tool in the lock with the alignment peg turned to the right. 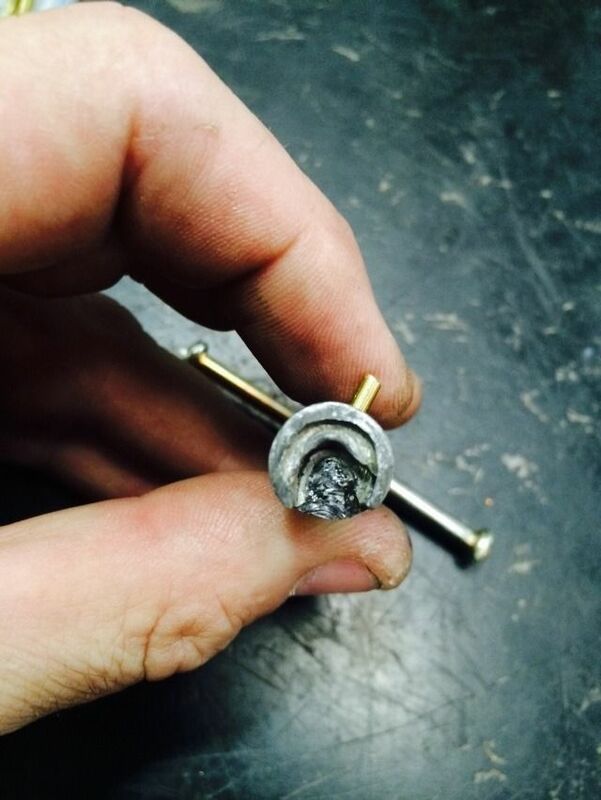 Push the tool inwards to compress the spring, then turn it to the right until it stops lightly. 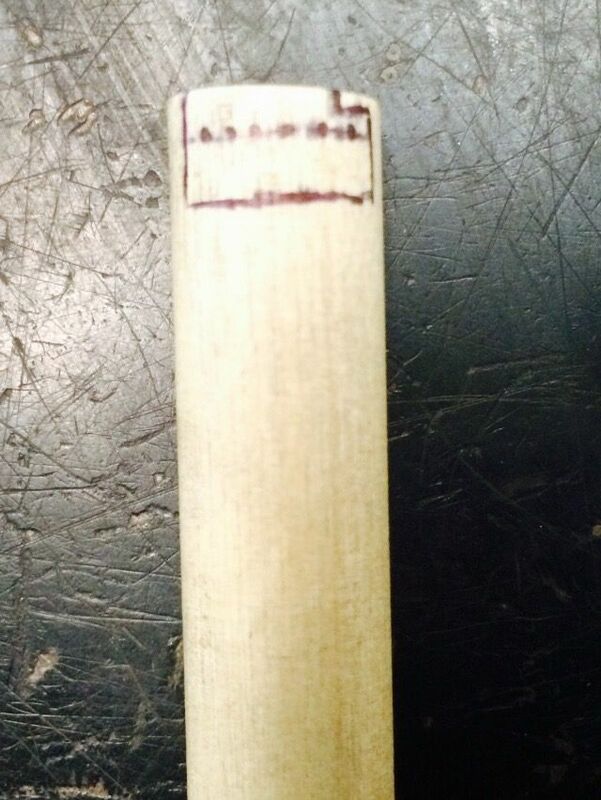 The alignment peg will be centered when it is properly turned. 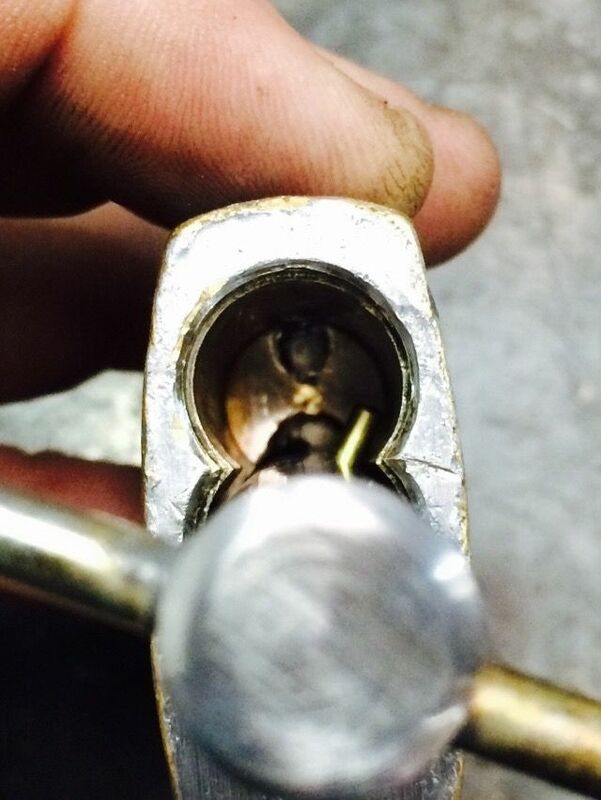 Then pull out the locking cam. OK, time for info on making the tool. 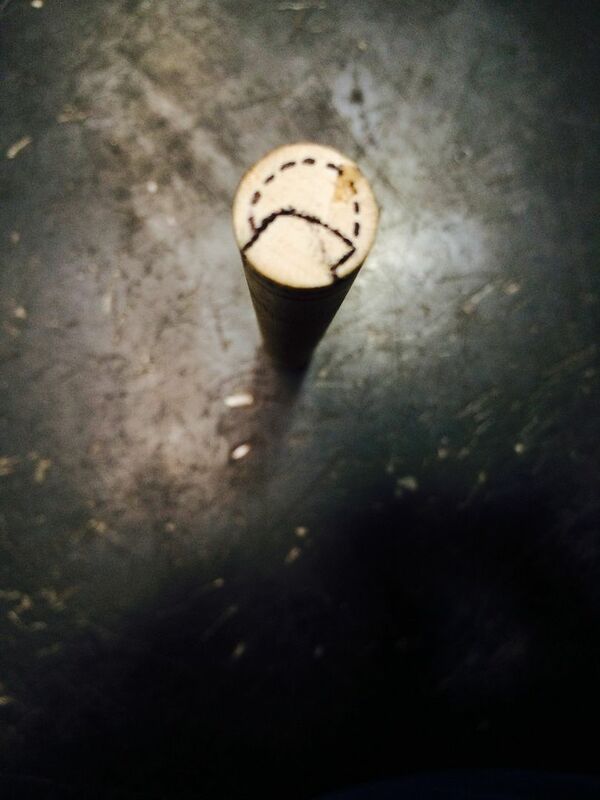 It is easier to show how it is cut by drawing it on a wood dowel. The easiest way to get the size and shape right is to scale the first picture of the dowel so it prints at 1/2" diameter. (About 12.6 mm). Tape or glue it to the steel rod, and use a dremel to cut it out. The dotted line is cut shallower than the solid line. That's some fine work there. where were you when I needed one? 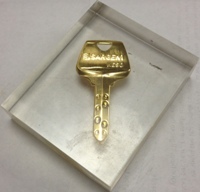 Riy had to give me the measurements and I made it out of some brass rod I had and it lasted for a total of 1 lock. (17:44:28) HAL 9000 Sez: LockSport is full of children who throw fits because low priced low security products sold in discount department stores do not meet their arbitrary expectations. I'll get a model drafted up tomorrow from those dimension and see what i can come up with in steel, perfect project to learn the 4th Axis better on the Mill! I got to see that tool in person yesterday. I am thoroughly impressed with the quality of work done on it. It looked like a quality production run tool. Gordon, you are a genius...current price on the BD654 tool from Stanley is 113 bucks! GWiens2001: Great video! Learned a lot about what fun can be had with a forklift and a chainsaw. Good Ol' Lock-Goblin-Gordon!!! Always breaking the mold. Big thanks to Gordon for helping out with the dimensioning and initial design but hope to have a few of these available soon... this one is the fist steel prototype but i'll be offering these in Grade 5 Titanium anodized to your choice of color. 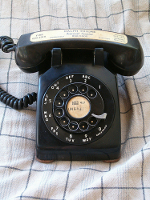 @l0ckcr4ck3r: I'm definitely interested in buying one! Same here. Love the clean lines and pro job! Can you make one in orange?! I may be in for a blue one too. (20:18:08) MBI: Me working for the CIA is about as likely as you working in the Middle East. Oh yes! $100+ is too much for a piece of steel, thanks Gordon for the info on this! And l0ckcr4ck3r, I'd possibly be interested in one of those too.